Swap distractions for stillness and return with fullness. Time in retreat allows us to step out of the complexity of life, to listen deeply to our body, heart and mind. This retreat offers insight, personal transformation and renewal in the company of like-minded individuals. Think differently about your life and work, and tune-in to a new frequency on every level. True leadership is an inner quality. It requires an inward journey. The deepest part of human nature urges each of us to rise above everyday circumstances and transcend our common nature. These personal shifts in awareness develop virtues such as responsibility, growth, love and service. The greatest need in leadership development today is an awakening and development of our humanity. Business professionals and entrepreneurs who are committed to personal growth and ready to take their life and work to the next level. EcoYoga centre has been created as an expression of a healthy, carbon free, sustainable lifestyle with luxurious accommodation for a genuinely ‘eco’ experience. Set in magnificent Scottish scenery with hills, lochs, wild rivers, waterfalls and forests, it is a unique space to retreat from the everyday world, connect with your true nature and return renewed. 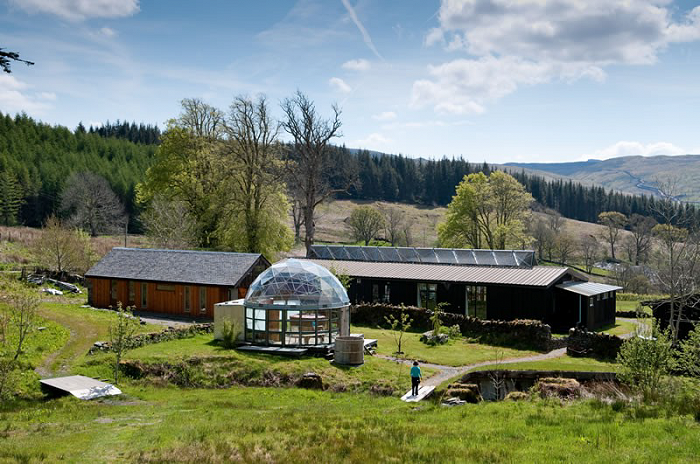 The sento dome, close to the main building and spacious yoga studio, offers rainforest showers and a hot tub that comfortably sits half a dozen people, set within a geodesic glass dome filled with natural light. All of the food is organic and locally sourced wherever possible. We believe that the kitchen is the heart of the retreat and that you should eat well, sleep well, stretch well and think well. So food is number one at keeping you healthy and in balance. Meal times are fun and sociable with the whole group sitting down together. We use as much fresh produce from our garden as possible, depending on the season, and all of the meals are vegetarian with options for vegan and wheat or dairy free. Please note that there is no alcohol available at the centre and you are asked to abstain from drinking throughout the duration of your stay. The Lower Gorge Bath sits where the river plunges into a natural gorge and joins the mighty Liever River. This deep bathtub has piped hot and cold water, and stands on a solid wooden platform overlooking a waterfall. Draw yourself an afternoon or evening bath that you will never forget. Each day will follow a pattern of morning meditation, yoga and dream work followed by the exploration of specific topics and facilitated group exercises designed to deepen awareness, explore the conscious and unconscious factors that may be holding you back and discover new, perhaps unknown energies. Each day will close with meditation and silence. Sealing the practice – integration into everyday practice. Late morning departure. Following the retreat you will receive a personal coaching session with Juliette via Skype. Inspirational…gained a vast amount of new knowledge…simply the best leadership course that I have ever attended. I am a highly experienced, award-winning retreat leader for Vistage and similar CEO leadership forums. A former chemical engineer with a decade of experience with chemicals giant, ICI, I moved into coaching in 2002, have led over 50 retreats and clocked up over 3400 hours of professional coaching practice. As an intuitive and empath, I help people connect with their true nature, cultivate personal well-being, and develop more meaningful and healthy relationships at home and at work. My natural passion for exploring the vast energy potential of the human psyche makes my retreats engaging, challenging and thought-provoking.